Reception from 5 pm during winter time and 8 pm during summer. 4 tracks, billiard tables, musical atmosphere, restaurant. 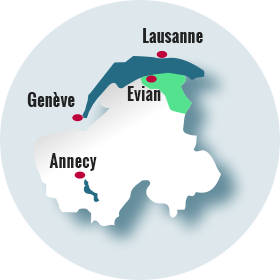 Cinemas in Evian-les-Bains, Thollon-les-Mémises, Bernex and Châtel. Europe's largest themed casino: 250 slot machines (1 cent deposit to €2). Playrooms with every european or american games, french and english roulette, Black Jack, Stud Poker. Let yourself be guided to the four corners of the village to discover Châtel and the wonderful surrounding landscapes. In summer and winter only. Departure near the entrance of the underground car park at 10 am, 11am, 12 pm, 4pm, 5pm and 6pm. €3/adult, €1,50/children under 12 years. Departure from pontoon of Casino, Cachat pump room or Mouettes port. From 15 April to 1st October, from Tuesday to Sunday, departure at 1.30 pm/ 2.15 pm/ 3 pm/ 3.45 pm and 4.30 pm. July and August, departure everyday at 10 am/ 10.45 am/ 11.30 am/ 1.30 pm/ 2.15pm/ 3 pm/ 3.45 pm/ 4.30 pm/ 5.15 pm/ 6 pm. €6,50/ adult, €5/child (from 4 to 9 years), €6/10-15 years, free under 4 years old. Mix: boat "L'Agrion" + train and visit "Pré Curieux" + train. The territory has many farms. Many farmers sell their products at the farm (Abondance cheese, goat cheese, wine...) and some of them organize visits on reservation.